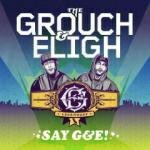 The Grouch & Eligh: SAY G&E! These two Living Legends members join forces again and make one of the year's finest underground albums to date. From OutKast to Organized Konfusion to Felt, hip-hop duos often churn out some of the genre's best music. Can anyone deny the impact and overall quality of an album like Aquemini, Stress: The Extinction Agenda, or Felt 2: A Tribute to Lisa Bonet? It's doubtful, except maybe for the impact of the Felt record. But that effort holds the most weight here, as it offers the most recent example of what happens when two rapper-pals come together to record an album. Murs and Slug, whom you know from Atmosphere, are stylistically different, but they remain consistent at times in their tone and content. And, though these two artists are likely closer than Murs and Slug, the same can be said for the Grouch and Eligh. These two Living Legends members could not be farther from one another on the flow spectrum. The Grouch is a free-flowing rhymer, sometimes picking and choosing when he'll spit. Eligh, on the other hand, packs syllable after syllable into his bars. Somehow, the man finds the time to breathe between lines, though it seems impossible. And while they are fully capable of dropping hits and solid records on their own accord, the Grouch and Eligh truly excel when they join forces, as on SAY G&E!. The album blends more stereotypical underground funk with touches of pop and everything else that falls in between. You have a straightforward burner acting as a lead single ("Say G&E! "), a catchy number with like-minded emcees Gift of Gab and Pigeon John ("All In"), and a Band of Horses-sampling thinker, "Comin' Up", featuring Mistah F.A.B. Like most of the tracks, those three were produced in-house by Eligh, whose talents are equally balanced between beat-making and rapping. But SAY G&E! 's instant and unwavering standout comes powered by the galactic brain of fellow West Coast abstract producer Flying Lotus. The absurdly talented L.A. beatsmith, who dropped one of last year's finest records dedicated to that same city, actually served up one of his more straightforward beats for "Old Souls". It's not without his trademark haunting, brooding female vocal loops and crunchy drums, but it never strays off course. And the beat fits the vibe of Eligh and the Grouch perfectly, making you wish the whole album was as golden as this. FlyLo also seems to bring out their finest wordplay. But it's not over yet! There's a third emcee looming in the background, waiting to make his calm, cool, and collected approach to the mic. It's Blu, the enormously talented rapper you know from his stellar debut with Exile, Below the Heavens, and projects with Ta'Raach and Mainframe. On "Old Souls", Blu delivers the goods as he has done since bursting on the scene a few years back. Yet he doesn't steal the spotlight. He only adds fuel to the song's fire. The only other joint that comes close is the funeral dirge "I Know You Wanna Feel", a breathtaking piece of depressing beauty. Its most interesting portion comes toward the end, when the hook gets all autotuned-out without causing you to gouge your eyes out. Also, both the Grouch and Eligh, who laces the gorgeous beat, come correct on the mic. Yet it just falls short of topping the aforementioned highlight. But balancing out "Old Souls" is "!Boom! ", the exact opposite of what you would expect from a track featuring Slug spitting the opening verse over an AmpLive production. Though it's nice to hear the Atmosphere emcee having fun like he did on the Felt records, the first of which the Grouch produced, Slug's weak bars leave you wondering why G&E had him on this record at all. As for AmpLive, of Zion I and the Radiohead revamp project Rainydayz Remixes, his hyphy snap beat is painfully dull. Sure it bangs in a nice system, but it feels flat and unimaginative. The song continues its downward spiral when the Grouch and Eligh grab the mic and spew forth boring lines. The overall attempt on "!Boom!" is appreciated. It's two guys and their friends having some fun. But it just should have sounded a hell of a lot better than this. That said, it's still the only true misstep on here. Even some of the weaker cuts, like the formulaic "Worried About the World", are not entirely skippable. SAY G&E! is one of this year's strongest and most balanced hip-hop releases to date. It would be a lie to say it came out of nowhere, since the Grouch and Eligh are underground mainstays. But it's still a pleasant surprise in a year when there has been very little to get excited about. SAY G&amp;E The Grouch &amp; Eligh Flying Lotus Blu Mistah F.A.B. Sage Francis Gift of Gab Rick Rock Pigeon John the grouch & eligh say g&e!